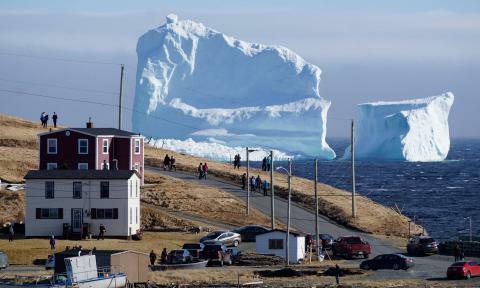 It is causing traffic jams in a remote town on Canada’s east coast, as tourists jostle for a glimpse of the mass of ice sitting in shallow water just off Newfoundland. The iceberg, which has dwarfed the nearby small town of Ferryland, is estimated to measure some 46 metres (150ft) at its highest point. “It’s the biggest one I ever seen around here,” mayor Adrian Kavanagh told the Canadian Press. The light blue behemoth has become a tourist attraction in recent days, as locals from across Newfoundland sit in bumper-to-bumper traffic for a chance to snap photos of the glacial giant. Their shots have flooded social media, showing the massive structure looming over local homes and sitting large compared to a helicopter hovering over it. Icebergs are no strangers to these parts – a large number drift through from the Arctic each year, earning the area the moniker “iceberg alley” and giving rise to a local industry focused on iceberg tourism. “You can see off in the distance on a clear day, you can see five or six big ’bergs,” said Kavanagh. Most of them simply float past the town, but this latest visitor appears to be grounded and could remain in place, he added. So far this year the number of icebergs moving into the North Atlantic shipping lanes has spiked, forcing vessels to either slow down or make long detours. Some 616 icebergs have moved into the shipping lanes so far this year, as compared to 687 in all of 2016. Experts say uncommonly strong counterclockwise winds may be drawing the icebergs south. Global warming has also been linked to the increase, as it has accelerated the process by which chunks of the Greenland ice sheet break off and float away.